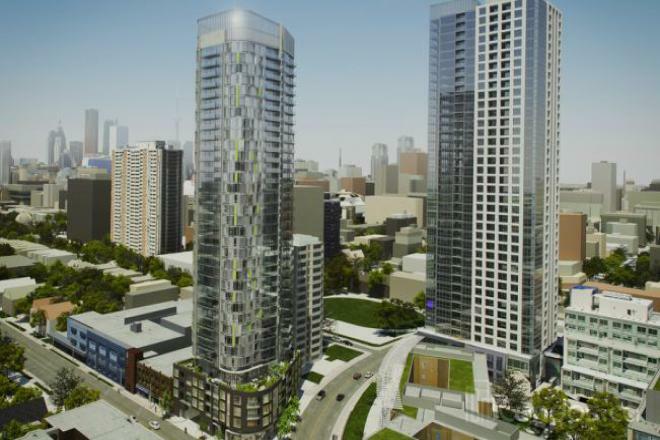 159 Wellesley Street East – Bousfields Inc.
Bousfields was retained by Diamond Corp. to obtain approval for a 35-storey mixed-use residential building, with grade-related retail uses, on a site located on the southwest quadrant of Sherbourne Street and Wellesley Street East. Situated within the apartment neighbourhood of St. Jamestown, the project rehabilitates a former gas station site by introducing a modern building, designed by Quadrangle Architects, with a street-related podium building and a slender tower element. Bousfields was responsible for preparing the Planning and Urban Design Rationale and draft zoning by-law in support of a rezoning application. The project was approved in February 2013.